The world's most famous stripe-wearing recluse is making his first appearance on WiiWare following a trio of outings on DSiWare. Where's Wally? Fantastic Journey 1 (known as Where's Waldo? 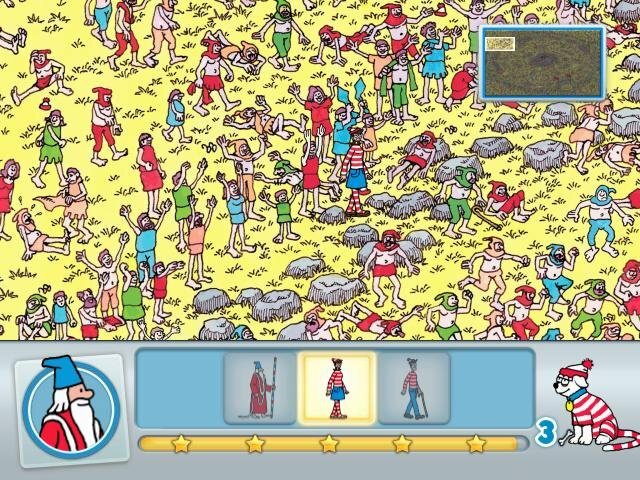 in North America) is all-but identical to the DSiWare release Where's Wally? Travel Pack 1, with the same stages and objectives, but it works much better on the big screen. It’s basically cut down from the larger retail release Where’s Waldo? The Fantastic Journey, available in North America. 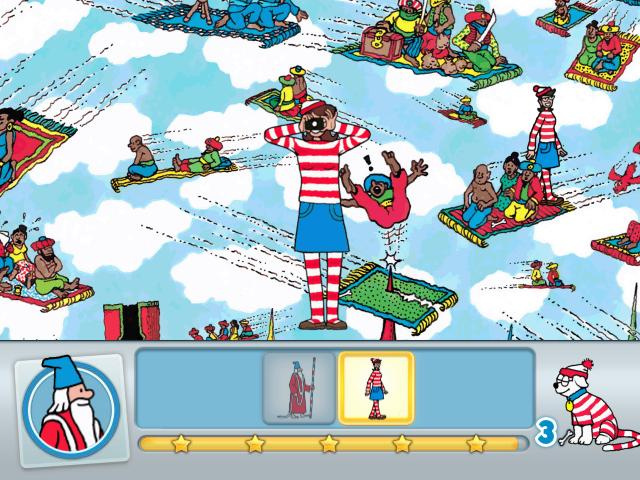 The premise is simple: find Wally and his friends across four levels, as well as stage-specific items or characters, and you can also play spot the difference with a dog. It doesn't exactly sound like the game that has everything, but it's surprisingly fun to play, which goes a long way with such a simplistic idea. There are two difficulties to choose from, easy and normal, which have one fundamental difference: easy mode has no scrolling, presenting you with a screen-sized slice of the big picture in which the object will definitely be found. When playing in normal, the field is wide open, and you can scroll by holding A and wielding the Remote appropriately. Once you've found the first three characters you're given a list of smaller objects to find and your field of movement narrows, though you'll still have to scroll around to find the items at hand. Easy mode is far too easy, though, and most players will find the objects in a matter of seconds, so it's recommended to play on normal as this prevents more of a challenge. While the graphics are clear enough played through component cables on a decent-sized HDTV, gamers with standard definition sets only might find it more difficult, particularly as there's no zoom function included. Sometimes it can be tough to differentiate between two similar characters or icons, especially when icons at the bottom are a little small to start with, so a zoom function would have been welcome. Competent item-spotters will complete the game on easy in less than 20 minutes, but normal mode games can take longer, particularly if you're aiming for five-star ratings on all stages. There's no best score or best time though, so the incentive to go back isn't as great as it could be, and although there's some variety to proceedings, the majority of objects to find are in the same places each time. Two players who want to share the fun of item-spotting can do so in the inappropriately-named Party mode, which splits the screen down the middle and sets you both off to find objects in your own area. A miniature tug-of-war takes place on-screen, and each item you find brings your opponent’s team closer to defeat until it's all over. 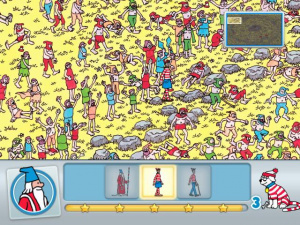 As far as multiplayer Where's Wally? goes, it's not a game you're likely to wheel out at every opportunity. There are some nice animation touches in each level, though not enough to interfere with the concentration required to master Where's Wally?, and for the most part everything is clear enough. There's some good quality music on offer and a peppering of voiced dialogue as well, creating a surprisingly polished title, though it's worth remembering the Where's Wally? WiiWare games started life as a Wii disc release before coming to download. Wally's made himself a decent home on WiiWare, and although it won’t take most players much longer than an hour or so, it's still fun while it lasts. More stages and a zoom function would have been appreciated, but as it stands, fans of the striped one will probably want to investigate this one more closely. We do one April Fools post a year. We posted it earlier. There will be no more April Fools, so there is no need to respond to every post with "April Fools". Thank you! @James_Newton: Sorry bout that I must have missed the one earlier. I wasnt sure if it was real or not guess it is. After looking at your Avatar pick James and than Waldos I see a resemblance. You too arent related are you? I still think the environments in Katamari Damacy games make for better Where's Wally games than any Where's Wally game. What is "Where's Wally" anyway? It looks utterly stupid. 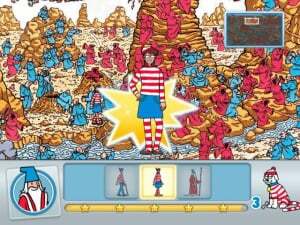 @ryanthehedgehog - Where's Wally (or Where's Waldo for American audiences) was a series of childrens' books where you would try to locate Wally (Waldo) in each of the books' pages. That's easier said than done, because the pages are cluttered up with myriads of people, so you'd have to pay very close attention to each page in order to locate him. 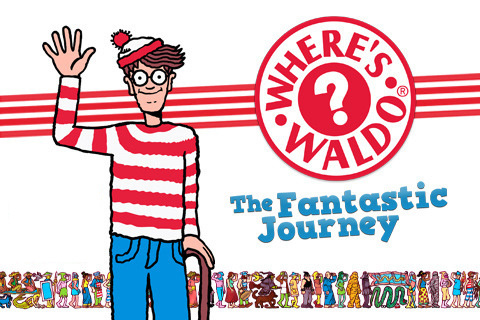 On a side note, I've always thought it was known as Where's Waldo in Europe as well. Guess not. it was "where is wally" here on mexico too. I wanna find Waldo in 3D. Sadly, after years in a Tibetan monastery, Wally never found himself. I doubt I'll be buying the game but the books were always fun.